C omplement of the day , I am Mrs.Ms . 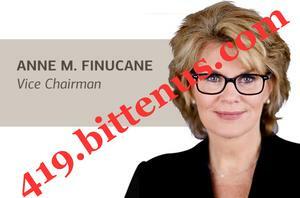 Anne M. Finucane | Vice Chairman Bank of America.I want you to be informed that your fund has been approved to be transferred into your Bank Account and also let you know thatyour fund was approved and originated from united nation which was mandated to be paid to you by the central bank of Nigeria as theBOA corresponded bank but due to unable to come up with the obligation and a lots of selfish interest from the corrupt government there,the united nation have mandated that your money should be directly be weird into your Bank Account from Bank of America without any further delay . New York, New York 10036with any means of your identification to Fill thefund payment transfer bond and sign.For us to make a successful wire transfer to your Account without any Delay sir.